House Panel Launches Probe into Trump Aide's Employment Amid Domestic Abuse Allegations - Integration Through Media ....! 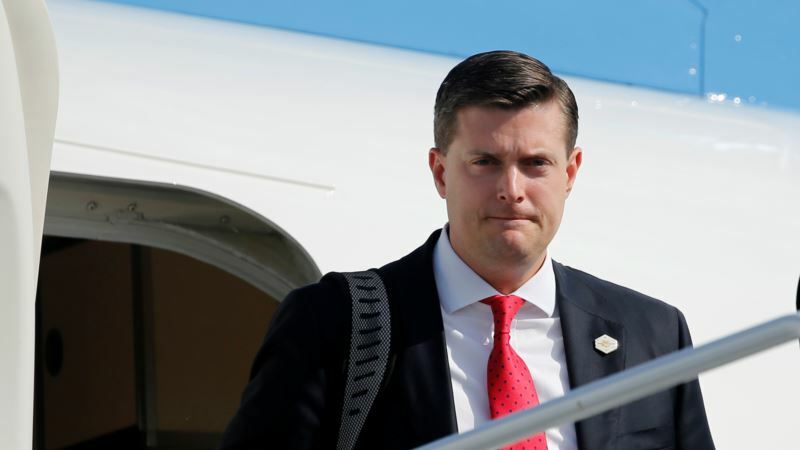 (VOA): The House Oversight Committee launched an investigation Wednesday into why President Donald Trump's staff secretary Rob Porter was able to keep his White House job for months after the FBI handed officials reports of Porter's two former wives accusing him of domestic violence. Porter resigned last week, but Federal Bureau of Investigation Director Christopher Wray told lawmakers earlier this week that investigators had briefed White House officials as far back as March 2017 about the spousal abuse allegations against Porter, who helped oversee an array of documents and policies sent to Trump for review. In an acknowledgement of a White House shortcoming, Vice President Mike Pence said, "I think the White House could have handled this better." At the center of the new investigation is the role played in the oversight of Porter by White House chief of staff John Kelly, a retired Marine Corps general and Porter's boss, and when he first knew of the accusations against Porter. The White House says Kelly only learned of the abuse allegations last week after they were detailed in a British tabloid, the Daily Mail. Pence praised Kelly's "remarkable job" as chief of staff, but dodged answering a question whether he felt Kelly had been "fully transparent" in disclosing what he knew about the accusations against Porter and when. In a letter to Kelly, Congressman Trey Gowdy, chairman of the House Oversight panel, asked for information on "the date on which any White House employee became aware of potential derogatory or disqualifying information on Porter … and which individual was so notified." White House press secretary Sarah Huckabee Sanders told reporters Tuesday that at the time Porter resigned, the allegations and recommendations on Porter's bid for a permanent White House security badge were still being reviewed by the White House personnel security office and had not been sent to higher-level officials. The Oxford- and Harvard-educated Porter was working at the White House under an interim security clearance. In an interview on CNN, Gowdy said, "I have real questions about how someone like this could be considered for employment whether there's a security clearance or not. I'm troubled by almost every aspect of this. "I didn't hire him," Gowdy said, "but who knew what, when and to what extent" about the abuse allegations? "If you knew in 2017 and the bureau briefed them three times, then how in the hell was he still employed? "The chronology is not favorable to the White House," said Gowdy, a South Carolina Republican who has announced he is not seeking re-election in the November congressional elections. Trump publicly praised Porter after his resignation and wished him a successful career in the years ahead, but had not made any public comment about the allegations made by Porter's former wives or domestic abuse more generally. Sanders had said during a daily press briefing earlier this week that Trump condemns such violence. On Wednesday, however, Trump finally condemned domestic violence. Answering reporters' questions at the end of a meeting in the Oval Office, he said, “I'm opposed to domestic violence and everybody here knows that. I'm totally opposed to domestic violence of any kind. Everyone knows that and it almost wouldn't even have to be said. So now you hear it, you all know it.” House Speaker Paul Ryan, the leader of the Republican majority in the House of Representatives, said, "Clearly we all should be condemning domestic violence.'' He added, "If a person who commits domestic violence gets in the government, then there's a breakdown in the system.'' Such a breakdown, Ryan said, needs to be "addressed." Allegations from ex-wives Porter's two former wives, Colbie Holderness and Jennifer Willoughby, have said they told FBI investigators details of their troubled marriages to the 40-year-old Porter in January 2017. Holderness provided a photo alleging that she sustained a black eye when Porter punched her in the face while they were on a vacation to Italy in 2005 and Willoughby offered proof that she obtained a restraining order against Porter in 2010. Wray, in testimony Tuesday before the Senate Intelligence Committee, declined to discuss the content of the FBI's reports on Porter sent to the White House, but said investigators "submitted a partial report on the investigation" in March last year, and then a completed background check in late July. He said the White House asked for "follow up inquiry" and that the FBI provided that information in November. Wray said the FBI administratively closed its investigation file in January, but "received some additional information" it passed on to the White House earlier this month. "I am quite confident that in this particular instance the FBI followed the established protocols," Wray said. After the story about Porter was published, Kelly and Sanders both released effusive statements about Porter's White House performance. But Porter's tenure at the White House unraveled quickly after publication a day later of a picture of Holderness with her black eye. Steve Herman at the White House contributed to this report.